Huernia lavranii is one of the 'stinky plants', whose flowers have a carrion smell and are pollinated by flies. Huernia lavranii is a picky plant. It must have a very well-drained soil, minimal feeding, full sun...a real princess, if I may. Black spot fungus and rot is its lot in life. 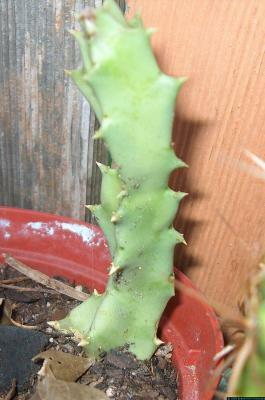 Huernia lavranii is a slow growing plant, but in mid spring it will start to grow, most likely. Stop watering in mid to late fall and only give it a few teaspoons of water, and only as you see pronounced wrinkling in the skin, until the weather has noticeably and irrevocably started to get warm. Full sun is a must for the healthiest plant possible. On the plus side, cuttings are easy to take and will grow if the cut is allowed to callous completely and all of the above conditions are met.